Prabbit, thanks for the info. indeed now i use goggles when playing and they do not steam up. to avoid sweat in the goggles I use a headband (cotton ones work well) and I have no problems at all. I play and I don´t even realize that I am wearing protective eyewear, so yes I think it is a must. yes I also agree that the benefits (costs avoided) are much bigger than the costs! "Get Tough with Polycarbonate Lenses. More durable than regular plastic, polycarbonate lenses are very lightweight and shatter-resistant. They also have the best impact resistance of any lens material, making them the lens of choice for sports eyewear, children or active lifestyles. Polycarbonate lenses are not only thinner and lighter in weight than traditional plastic spectacle lenses, they also offer ultraviolet protection and scratch-resistance. In addition, they are very impact resistant." It is clear any person wearing specs MUST have polycarbonate lenses for sport, and they are also great for all wear anyway though they may scratch a bit easier. Don't even understand why they sell the other material really. Before polycarbonate was available the specs were so heavy they would fall off your face when running up the front of the court to retrieve a dropshot, and many of us squashies then turned to contact lenses. 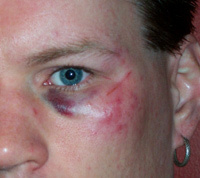 Just looking at that photo again very closely there is a lot of bruising but the eye looks perfect. Thank heavens. My lenses are polycarbonate, which is extremely hard and a squash ball or a racquet is not going to break the lens. What broke was the frame itself. In the accident that happened the bottom edge of the lens is (part of) what cut my face. The ball is also responsible for a lot of the swelling. Like I said in 2005 and still say today even though I am now wearing prescription lenses that cost more, it's a whole lot cheaper to wear (and replace) goggles than it is to replace an eye. I do wear a headband and my goggles. I don't have a problem with sweat getting into my eyes, nor do I have an issue with my lenses fogging. It's when I don't wear a headband that I'm constantly wiping off my goggles. The most protective eyewear would be I-MASK, a full mask, that protects the teeth, nose and eyes. hi there all, I am new to the site, so hi. I got hit once just above my eye, so decided to use eyewear. problem was sweat (I did not use a headband...thought that would be "too much"....now I may try it) finally got scratched. now i´ve got new ones I haven´t used yet but I plan to use. my question for prabbit is that it actually surprises me that as you say, your goggles got broken which indeed hurt your face. is it not risky then that if goggles brake, they can indeed cut your face...or eye????? you can get an anti-fogging spray or some eyewear already has an anti-fogging coating. they will often steam up after taking them off for a while in between games then putting them back on again. slavi is right - it is when the eyewear cools down then you put it back on, the moist air condenses more easily on the polycarbonate surface. the other alternative is to wear the imax which sits away from the face a little more and has a little more air circulation around it and is less likely to fog up. unfortunately they are not to everyones' liking. The reason is temperature related, so you should make the googles "warm". Try to keep it for a while in sauna, before you go to the court. And anyway, My Prince (Sorry for advertising) googles never go steamy. I have been playing squash for only a short period of time and have already been hit in the eye with the ball, luckily I didn't sustain a serious injury. This prompted me to search for some protection which I found courtesy of e-bay but unfortunately I am not able to use them. The problem is that I can't stop the glasses from steaming up. If any one has any ideas how I could solve this problem I would be very grateful. Incidentelly, every where you look on the net you are advised to wear protection but I am as yet to see any photos on the net of any players wearing protection ! thanks for a powerful post. I wear glasses and am considering goggles instead. You've helped me make the decision. That's great that you could continue the game. I have a bit worse experiences with my friends :( meaning the pool of blood on the floor, emergency, etc. Now I am pretty careful player and for sure I am not playing to kill. So, if i may loose a point I loose the point without causing dangerous situation. Even if it's "no let" I do not care. Maybe it is wrong (and it is wrong according to my coach), but I care about my opponent as well. But from the other hand it helps a lot because I am totally relaxed on court. I was actually able to continue playing. I took about a five minute rest to put some ice on it, but other than that I was fine. It's one of those "it looks worse..."
Wow, such a terrible story... I am sorry for you, Prabbit. now you know how others feel after talking to you for about half an hour!! prabbit - thanks for your story which our members will appreciate,and the photo shows the proof. You sure would have looked bad without that eye in tact. Most Dentists would say to wear the mouth guard too - so we might have to recommend Slavi's I-MAX helmet to be certain. Talking about reverse boasts off the serve - that happened to me when I was playing a left hander - so I served from the forehand box, the left hander reached up to take the ball before it hit the side wall, and slammed me fair in the ear as I turned my head quickly to avoid the ball. The reverse boast would not have even made the front wall either - I was not impressed, and had a red burning ear for about half an hour. Too close for comfort.